I want to express how thankful I am that you have been so kind to us at Turtle Dance Music. I mean that genuinely. The parents and kids have been nothing less than extraordinarily kind. People have shown kindness through the tone of their voices. Through the warmth of their facial expressions and smiles. I love talking to people in person or on the phone. One mother told us after a show on Saturday how much her kids enjoyed our performance and that it was “the fastest hour she has ever been to at a library program.” I was very proud of that. I was also very sad because I like talking to all the kids and parents and engaging with everyone. You can’t talk to everybody – but there was one Dad who wanted to talk with me at the Middle Country Public Library show on Saturday in Centereach and I had to ignore him because there were a line of kids beneath me who needed my attention. I felt bad about that because I know what it’s like to see a show, to try to talk with a performer or a friend afterwards and not get any attention. It stinks. I like to give everybody my full attention – especially when they want to tell me something. I like talking with people. I like hearing people’s stories. I like hearing your thoughts. You are important to me. I am also incredibly overwhelmed by the end of every show. 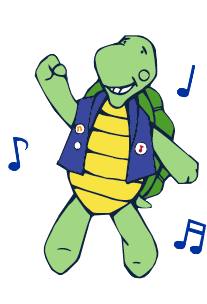 I put so much energy into making sure that your kids have a joyful and incredible experience that I am exhausted by the end of all Turtle Dance Music performances. There is nothing less than high energy. If any parent or child feels like I haven’t given them enough attention – please call me or e-mail me anytime. I’m always here to talk and listen to your thoughts and I definitely want to hear what you have to say. I love deep, meaningful conversations. That’s the kind of person that I am and thats the kind of person I always want to be. We are part of the “Kidz Cabaret Series” and it will be amazing. January 31st, 2015. 1 P.M. and 3 P.M. Please come to either show! It’s going to be incredible and amazing. It will be beautiful. We would love to have you and your family there. E-mail me or call me anytime.